In response to my previous post announcing the SilverlightDefaultStyleBrowser tool for working with default styles for Silverlight 2 controls, I got an email from Rob Relyea suggesting that I make SilverlightDefaultStyleBrowser available via ClickOnce as well. (For those who may not be familiar with it, here's a brief ClickOnce overview.) ClickOnce is simple to configure, adds a Start Menu entry automatically, supports seamlessly updating an application, and installs/uninstalls on Vista as standard user without requiring elevation - so this was easy to do! Note: The source code for SilverlightDefaultStyleBrowser is available only in the ZIP file download. When customizing the look and feel of a Silverlight 2 control, people usually want to start with a copy of the control's default visuals. Unfortunately, getting at the default XAML for a control isn't always obvious or easy. A control's default XAML is stored in a specially named resource of the control's assembly and that resource (named generic.xaml) isn't particularly easy to get at by default. The good news is that the controls in the Silverlight 2 Beta 1 SDK/Tools are documented on MSDN and that documentation includes the default styles. But sometimes I prefer something a little "closer to the metal", so I wrote a small WPF 3.5 application to improve this experience for developers and designers working with Silverlight 2 controls. SilverlightDefaultStyleBrowser is a simple application that automatically extracts the default styles from an assembly's generic.xaml, lists the available control styles, and presents them in an easy-to-browse manner with syntax highlighting, automatic formatting, and expandable/collapsible nodes. The common scenario of copying a Style or Template is made easy by two dedicated buttons that do just that! Using SilverlightDefaultStyleBrowser is deliberately simple. When the application loads, it automatically looks in the Silverlight SDK default install directory, parses all the assemblies it finds there, and adds the relevant styles to its list (as seen in the image above). Adding additional assemblies is as easy as hitting the "Add Assembly" button, selecting the assemblies, and hitting OK. Once the styles are loaded, simply select the control of interest to browse its default XAML. The "Copy Style to Clipboard" button copies the XAML for the entire style to the clipboard. The "Copy Template to Clipboard" button copies just the template XAML from within the Style (probably the more common scenario). Paste the copied XAML directly into your Silverlight application, tweak it or customize it, and you're set - it's that easy! SilverlightDefaultStyleBrowser tries to make things as easy as possible, but sometimes it's still necessary to edit the generated XAML a bit to get it to compile. Usually, this is because the XAML is referencing a non-default namespace that didn't get copied over because it wasn't directly part of the XAML (ex: the "local:" prefix in a TargetType attribute). In these cases, it's necessary to add the xmlns mapping manually. However, the default behavior of SilverlightDefaultStyleBrowser should provide a simple paste-and-go experience in most cases. WatermarkedTextBox in the System.Windows.Controls.Extended assembly is not listed because that control uses its own private XAML resource instead of generic.xaml. You'll need to refer to the documentation if you want that control's default XAML. The mysterious entry for "Control" actually applies to the GridSplitter control from the System.Windows.Controls.Extended assembly which is using a non-standard mechanism to store this style. The templates for Silverlight 2 Beta 1 controls that are not part of the SDK (ex: TextBox, ItemsControl) are not stored in generic.xaml form and are therefore unavailable to SilverlightDefaultStyleBrowser even if you add all the assemblies in the Silverlight install directory. Silverlight and WPF are all about allowing developers and designers to easily customize the look and feel of their applications. I hope SilverlightDefaultStyleBrowser helps make that process even easier for both groups! I've just finished updating the code to back each of the settable HtmlTextBlock properties that mirror TextBlock properties with a DependencyProperty in order to enable data binding and maintain HtmlTextBlock as "plug-compatible" with TextBlock as possible. Most of this was pretty straightforward (boring) typing, so I'll confess that I have not tested each property individually. :| But I did create a simple project (attached to this post) demonstrating HtmlTextBlock data binding - both standalone and within a ListBox DataTemplate - that interested readers can use to play around with this. I've also updated the HtmlTextBlock.cs file in the existing HtmlTextBlock source code download. Thanks for the feedback, eibrahim, I hope you and others find that the new data binding support works well and enables even more compelling scenarios! A few months ago when Silverlight 1.1 Alpha was all the rage, I wrote a sample control that made a best-effort attempt to display simple HTML markup in Silverlight. The original HtmlTextBlock post described the control's purpose and the follow-up post detailed a number of improvements to HtmlTextBlock. (Please continue to refer to those posts for background and implementation details.) Now that Silverlight 2 Beta 1 is released, I've had a few internal and external requests to modify HtmlTextBlock to work with the latest Silverlight bits. I've updated the original HtmlTextBlock demonstration page and also updated the original source code download, so don't hesitate to try things out in your own browser and/or download the code to see how it works! There were no fundamental changes to the features HtmlTextBlock uses, so the port from 1.1 Alpha to 2 Beta 1 was straightforward. Thanks to Silverlight 2's flexible layout system, the code to override Width/Height/ActualWidth/ActualHeight and handle the Loaded event is all now unnecessary and has been removed. The XAML passed to Control.InitializeFromXaml now specifies the default XML namespace. Silverlight 2 Beta 1's TextBlock exposes the new properties LineHeight, LineStackingStrategy, and TextAlignment which HtmlTextBlock mirrors. A handful of properties/classes changed names/types slightly. The syntax for creating an instance of the Silverlight control in HTML has changed to use the <OBJECT> tag. Curiously, certain text/style/size combinations don't seem to render under Silverlight 2 Beta 1. For example, viewing the initial sample text at Verdana/8, Lucida Sans Unicode/10, or Times New Roman/10 shows an empty box. Because changing the font face/size doesn't actually change the Silverlight object tree that HtmlTextBlock creates, I'm inclined to believe this is a rendering issue with the Silverlight Beta rather than a bug in HtmlTextBlock. However, if anyone finds otherwise, please let me know! It's always great to hear that people have found value in the stuff I've posted to my blog. 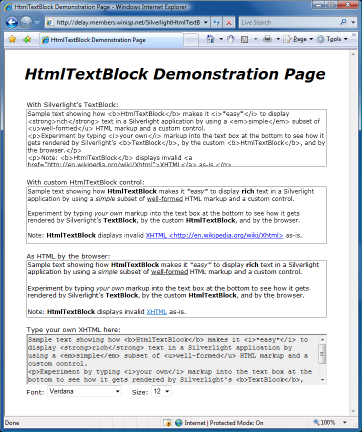 I hope that those of you who are using HtmlTextBlock continue using it successfully with Silverlight 2 Beta 1 - and that newcomers find something useful as well! Caveat: ConvertClipboardRtfToHtmlText is a simple utility written for my specific scenario. I'm releasing the tool and code here in case anyone wants to use it, enhance it, or whatever. I have NOT attempted to write a solid, general-purpose RTF-to-HTML converter. Instead, ConvertClipboardRtfToHtmlText assumes its input is in the exact format used by Visual Studio 2008 (and probably VS 2005). Paste the HTML code on the clipboard into your blog post, web page, etc. I'm the first to acknowledge there's a lot of room for improvement in step #2. :) While the current implementation is good enough for my purposes, I encourage interested parties to consider turning this into a real application - maybe with a notify icon and a system-wide hotkey. If you do so, please let me know because I'd love to check it out! // pasting into a web page or blog. // enough on the simple input I've tried, but may break for other input. // TODO: Convert into a real application with a notify icon and hotkey. In my Silverlight 2 ListBox/ScrollViewer FAQ I described some common scenarios and demonstrated how to implement them with sample XAML/code. In this post I demonstrate three UNcommon ListBox/ScrollViewer scenarios - again showing the XAML/code that makes them possible. 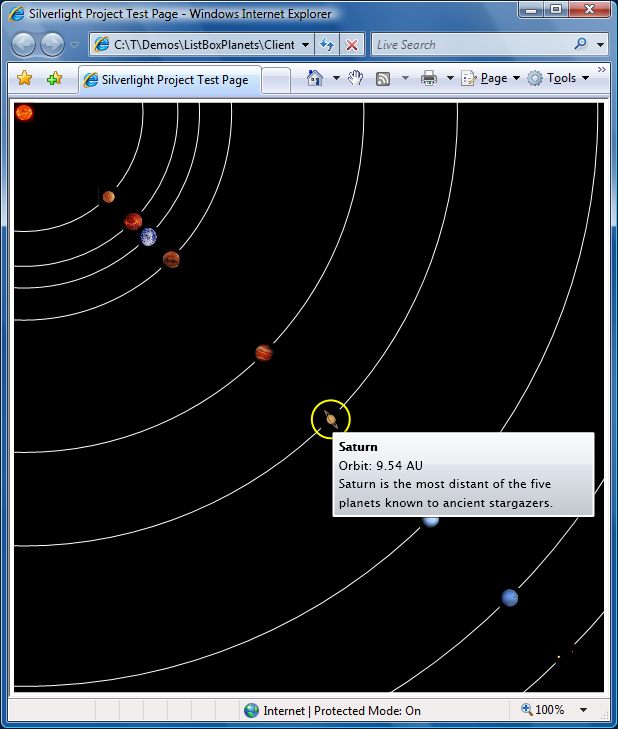 When I saw Beatriz Costa's "PlanetsListBox" WPF demo of a fully functioning ListBox that looked like the solar system, I was stunned and knew I had to port it to Silverlight. One day I was working on a perfectly sensible ListBox sample with images when my teammate Ted suggested making a simple Slideshow with ListBox. It's not the craziest idea he's ever had, so I decided to humor him. On a discussion list one day, someone innocently asked for a way to scroll text. I immediately thought: <MARQUEE>! <TextBlock Text=" This message bounces! " I've made the complete source code I used to build these samples available as an attachment to this post for anyone to play around with. If you come up with your own wacky use for ListBox or ScrollViewer, please let me know. It's always interesting to see the clever, creative ways people end up using stuff like this! Created a new WPF project. 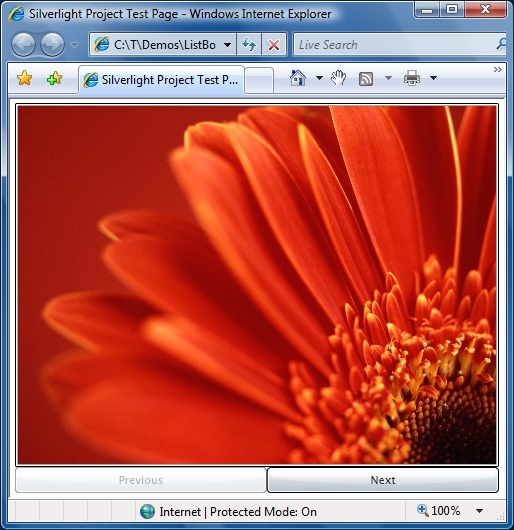 Copied all code files directly from the public Silverlight 2 Beta 1 controls source code download. Copied default styles from the associated generic.xaml file to the new project's Window1.xaml as implicit styles for the Silverlight control implementations. Removed TemplateBindings from ContentPresenter/ScrollContentPresenter because they're not necessary on WPF (the ContentControl-ContentPresenter hook-up is done automatically) and removed Setters for related properties. Added Animations to ListBoxItem's "Normal State" because the "restore default settings" behavior that's core to Silverlight's parts model specification is not present on WPF. Updated the assembly name for some XAML used by the unit tests. More details: Search the solution for comments with the text "LB-SV-WPF:"
What's the meaning of the WPF/WPFIMPLEMENTATION defines in the controls source code? The development of ListBox (+ListBoxItem) and ScrollViewer (+ScrollContentPresenter) was done in parallel with the development of their base types (e.g., ItemsControl, ContentControl) and also in parallel with the development of the Silverlight 2 platform itself. To minimize the risk/impact of developing on a changing foundation, I did much of my development and unit testing on WPF by deriving from the corresponding base classes, using only the subset of WPF that Silverlight exposes, and avoiding features specific to either platform as much as possible. When compiling and running on WPF, I would add "WPF" to the list of conditional compilation symbols for the project. Therefore, code inside an #if WPF block applies only when running on WPF. In many cases, the pattern is #if WPF ... #else ... #endif and this corresponds to instances where some bit of code needed to be different between the two platforms (typically because it used features that weren't identical across both). In some cases, the relevant code only applies to one platform and the #else is missing or #if !WPF is used instead. The meaning of "WPFIMPLEMENTATION" is similar and is used by the unit tests for code that applies only when testing the WPF implementations of ListBox or ScrollViewer. I used unit tests in three different scenarios to help ensure the code was as correct and compatible as possible: testing the Silverlight implementation on Silverlight, testing the Silverlight implementation on WPF (#if WPF), and testing the WPF implementation on WPF (#if WPF, #if WPFIMPLEMENTATION). Though it may seem silly at first, the point of testing the WPF implementation on WPF was to make sure the unit tests were validating the correct behavior. Silverlight 2 Beta 1 is available today, yay!! I'm celebrating by publishing an FAQ of sorts for the controls I worked on. While not all of the topics below are "frequently asked questions" (it's a little too soon for that...), they're all intended to help developers get started by covering the basics of these controls. If you're already familiar with WPF, then Silverlight should come pretty easily to you - but I'd still recommend skimming the topics below because some of the details are unique to Silverlight. If you're new to WPF and Silverlight, then I hope the topics below help jump-start the development process. In either case, I welcome your feedback, so please leave a comment below or contact me with any questions/problems/ideas you have! What does this FAQ cover? The Silverlight 2 Beta 1 controls I worked on: ListBox, ListBoxItem, ScrollViewer, and ScrollContentPresenter. What's a good strategy for investigating possible bugs? If you're trying to do something new and running into behavior that seems wrong, it's often helpful to identify exactly what/where the problem is. My first step is often to try the same scenario on WPF - if the behavior is the same there, then it's probably not a bug (and at least Silverlight is consistent!). But let's say the scenario works fine on WPF - my next step for ListBox problems is to try the same scenario using ItemsControl. This isn't always possible because ItemsControl offers only a subset of ListBox's functionality, but if I'm able to reproduce the problem using just ItemsControl, then ListBox is off the hook and that's a big chunk of code that's no longer in question. If ItemsControl isn't responsible, the next step I'll take is to switch to a debug version of System.Windows.Controls.dll so I can set breakpoints, tweak the control internals, etc.. For bugs in ListBox or ScrollViewer, this should be enough to identify most problems; for bugs in Silverlight, this helps to narrow things down. 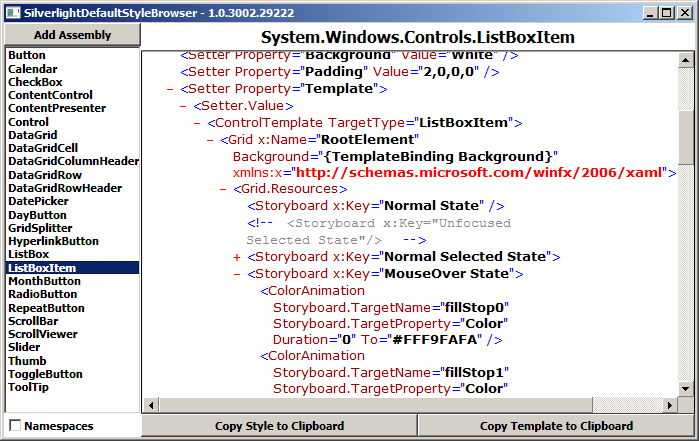 Here is the XAML code for a handful of the most common ListBox scenarios along with a picture of what it looks like on Silverlight. Why is SelectionMode.Single the only supported SelectionMode? 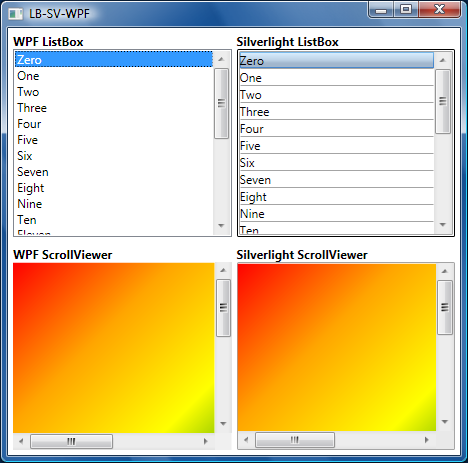 The Silverlight controls are subsets of their WPF counterparts in order to keep complexity and download size as low as possible. In cases where it seemed that specific functionality was not widely used, we opted to exclude it for Beta 1 and use customer feedback to identify which missing features are the most important. SelectionMode.Multiple and SelectionMode.Extended both fall into the category of "very nice to have, but seemingly not critical for most scenarios" - if you need multiple selection support, please let us know! Why does the ListBoxItem.ChangeVisualState method overlap playing the old/new Storyboards? The pattern of changing visual states by calling Begin for the new Storyboard and then calling Stop for the old one is a key part of the Silverlight state model. Starting the new Storyboard begins applying the values of whatever animations it represents (as you'd expect). Stopping the old one then automatically resets any animations it represents that aren't also being changed by the new Storyboard. Manipulating the two Storyboards in this particular manner is necessary for the correct visual behavior under Silverlight. Why is the scrolling behavior slightly different than with WPF? If you have a ListBox with enough items that a vertical ScrollBar is displayed, using the Page Up/Down or arrow keys to scroll through the list behaves just a little bit differently on Silverlight than on WPF. In particular, WPF's default behavior is to keep the top-most item fully visible and flush against the top of the ListBox at all times. Therefore, scrolling doesn't affect the items' vertical placement until the very beginning/end of the list. Silverlight does not have the same behavior with respect to the top-most item, so the item placement tends to change slightly while scrolling through the list. This behavior difference is due to the fact that the WPF ListBox's default Style overrides the default ScrollViewer.CanContentScroll value of False and sets it to True, changing the ScrollViewer's scrolling mode from physical scrolling (pixel-based) to logical scrolling (item-based). Silverlight's ScrollViewer supports only physical scrolling, so this override is not present on Silverlight. To see the same Silverlight scrolling behavior on WPF, set ScrollViewer.CanContentScroll="False" on any ListBox with ScrollBars. Note: The problematic object-to-ListBoxItem mapping is unnecessary when the items added to the ListBox are of type ListBoxItem. Therefore, if you need to store the same object multiple times, consider wrapping your items in unique ListBoxItem instances (setting the Content property to the wrapped item) before adding them to the ListBox. Why can't I arrow up/down past a ListBox item with Visibility Collapsed? Because ListBox doesn't expect there to be "invisible" ListBoxItems. If you try the obvious workaround of leaving the ListBoxItem Visible and marking its Content Collapsed, arrow navigation no longer gets "stuck" - but the scenario is still confusing to the user because the ListBox lets focus get set to the "invisible" item. Rather than playing with Visibility, consider the more direct approach of removing items from the collection if you don't want them to be visible. An elegant approach is to use an ObservableCollection for storing items and then assign that collection to the ItemsSource property of the ListBox. Because ObservableCollection implements INotifyCollectionChanged, changes to it (e.g., via Add/Remove) are automatically communicated to ListBox's ItemsControl base class which automatically updates the ListBox display. All you need to do is keep the collection up to date - everything else is handled for you. The following C# static class implementation can be added to a project to introduce extension methods to help work around the bugs described above. Simply call the corresponding extension method after setting one of the associated properties and the proper behavior should occur. Please note that calling these methods is not typically necessary and should be done only if a scenario is affected by one of the above bugs. /// and call the extension methods just after the properties they match. /// SelectedIndex before the ListBox is visible does not update the UI. /// IsSelected before the ListBoxItem is visible does not update the UI. Why doesn't ScrollViewer support the ScrollViewer.CanContentScroll property? See the "ListBox Implementation Notes" section above for an explanation of how Silverlight controls try to be a minimal subset of core functionality and the "ListBox Curiosities" section for an explanation of how the lack of ScrollViewer.CanContentScroll affects ListBox. Why is there no ScrollChanged event or IScrollInfo interface? As with ScrollViewer.CanContentScroll, these were deliberate omissions intended to keep things simple and compact. Why does the ScrollViewer default to HorizontalScrollBarVisibility Disabled and VerticalScrollBarVisibility Visible? For compatibility with the WPF defaults, of course. :) Regarding the obvious next question about why those values are the WPF defaults, I don't know. Auto/Auto would seem more generally useful to me and, in fact, the WPF ListBox (and Silverlight ListBox) overrides the ScrollViewer defaults to set Auto/Auto! 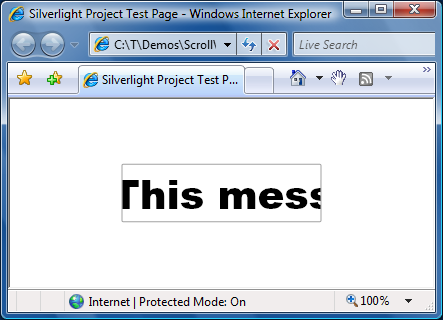 But maintaining compatibility wins, so the Silverlight ScrollViewer defaults to the same values used by WPF.